Welcome to the Fortnite Season 7 Week 7 Challenges: Battle Star Treasure Map & Expedition Outposts Locations Guide. Here you will find out how to get to the Expedition Outposts & Treasure Chests Locations in Fortnite Battle Royale on PS4, Xbox One, PC, Mac, Switch & Mobile. 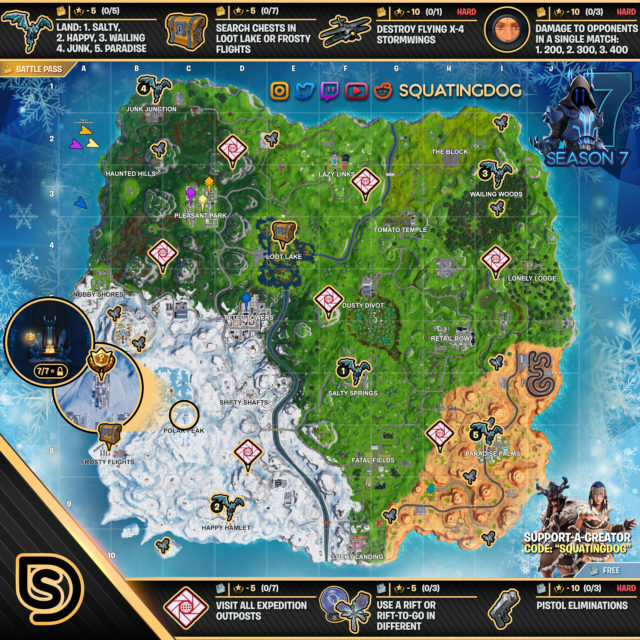 How To Find Search Challenge Locations In Fortnite Battle Royale – Season 7 Week 7: This guide will show you Season 7 Week 7 of Fortnite’s Battlepass Challenges that includes finding all of the Chests as well as the Expedition Outposts locations around the map. Note: The Weekly Challenges will be available on January 17th at 4am ET/8am GMT. Tips: By completing two weekly challenge sheets, you are rewarded with a loading screen that has a secret banner hint. 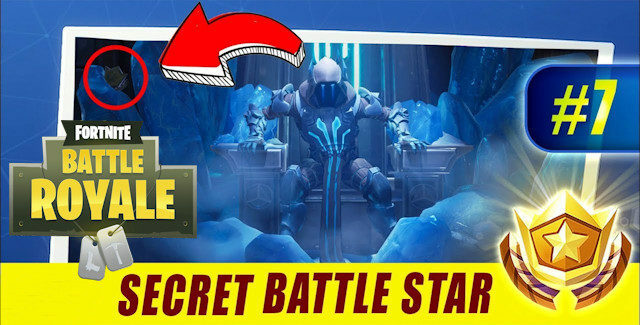 This loading screen leads you to the throne room at Polar Peak. Reward: It will reward you with one full battle pass tier. Bonus Reward: Completing every challenge in 7 different weeks (complete 60 weekly challenges) will unlock the secret Snowfall Skin. Tips: Here’s the easiest way is to go to one of the expedition outposts and grab a plane including a nearby weapon. Now fly to a safe area without enemies and land. Shoot at the plane until it has little health left and fly it straight up into the air. Jump out again and rush to the ground to shoot at the Stormwing while it is in freefall. Tips: There are several static rifts on the map that will never change position and can be used as often as you want. These can also be used to complete this challenge. Once of these static rift locations is underneath Wailing Woods inside the underground base. Simply use these rifts in 3 different matches to complete the challenge. Tips: The Expedition Outposts are red buildings that can be found throughout the map. Simply walk inside each one for it to count towards the challenge. The in game challenge counter will go up for each Expedition Outpost you visit. Note: You’ll need to win/lose the game for the Expedition Outposts you’ve visited to count towards the challenge. You cannot just quit the game. Time to complete Fortnite Battle Royale’s Battle Pass Challenges for Season 7 Week 7!